English language should be used as a tool by the younger generation to achieve their objectives. 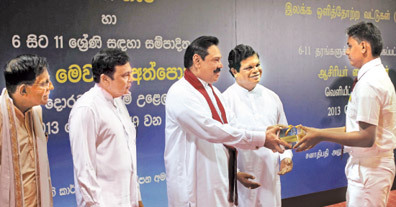 The government has well understood the importance of providing facilities to improve their skills in English, President Mahinda Rajapaksa said yesterday. “It is our duty to provide the necessary tools for students to learn the English language,” he said. The Tamil and Sinhala students did not receive opportunities to learn each others languages, he said. President Rajapaksa said the country had an era in which the English speaking elites had the social upper hand and they mocked rural students who tried to speak in English. He said they were ridiculed by these elites when these children of the rural masses were making pronunciation or grammatical errors . “This is the reason why the children of the rural masses were suffering from Anglophobia. They were afraid of speaking in English,” he added. This society looked upon them with contempt. There is a shortage of English, Science and Information Communication Technology teachers in schools, the President said. The President said the country’s masses could not reap the real benefits of the free education system though it was introduced to the country several decades back. President Mahinda Rajapaksa was speaking at the launch of phase III of English as a Life Skill programme at Temple Trees yesterday. A set of 50 English language learning DVDs for Grades 10 and 11 students and a tool box of activities for teachers from Grade 6 – 11 were launched on this occasion. The DVDs were produced by the National Institute of Education together with English teachers and education directors in rural schools. Students of nine schools representing each province received DVDs from the President. President Rajapaksa said opportunities were not made available for students to learn languages such as English. He said graduates who were recently appointed as ICT teachers have refused to work in rural schools. The President said the government is providing IT and multi - media facilities to schools. He said the students have started talking in different languages now and the teachers are keen in teaching languages too. President Rajapaksa said students would be more enthusiastic towards learning English, if marks are given to their oral and listening skills. He said students should be given more time to prepare themselves before this move is implemented. The President said the shortage of English teachers will have to be quelled before the implementation of this programme. President Rajapaksa said schools need 400 English teachers and these vacancies should be fulfilled. Education Minister Bandula Gunawrdena, Education Ministry Monitoring MP Mohanlal Grero, Governors of nine provinces, Secretary to the President Lalith Weeratunga, Presidential Advisor and Coordinator of the Presidential Initiative on English as a Life Skill Sunimal Fernando were present.